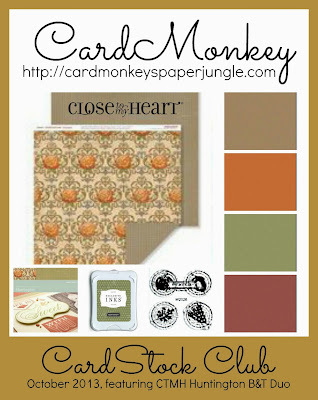 CardMonkey's Paper Jungle: Recorded and Noted: You're the Best! For this card, I added some yellow seam binding ribbon to add a little pop, but otherwise, the card is pretty much as it was designed by the good people at The Card Kitchen. If your crafting mojo runs hot and cold, I encourage you to subscribe to card kits like The Card Kitchen. Sometimes you'll like to make exactly the card that's shown; other times, spread your creative juices around and change it up -- it's your card, it's up to you! 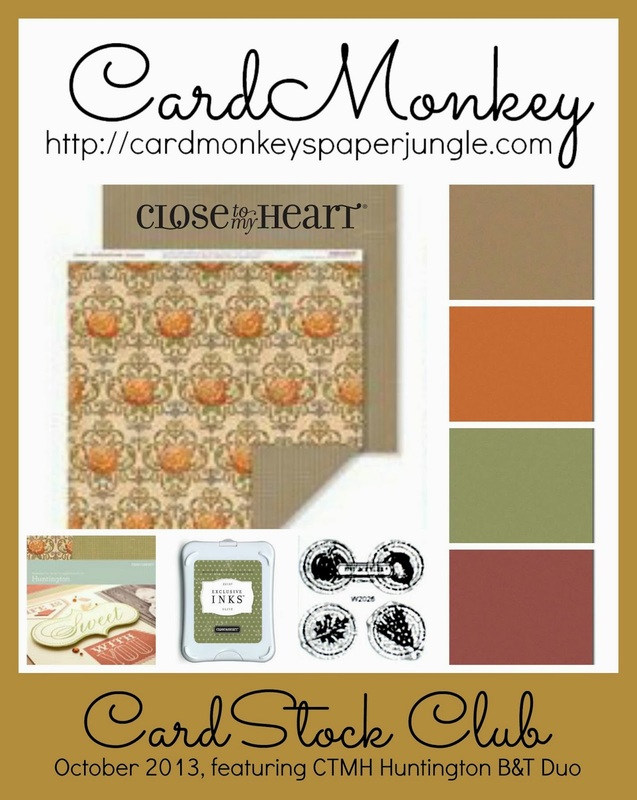 Speaking of kits, I have a very special one of my own: My ongoing CardMonkey CardStock Club (CCC) provides 15 sheets of fantastic Close To My Heart paper that cuts like butter in your Cricut or Silhouette. Each month for just $25 (including shipping! ), you'll receive three 12x12" sheets of CTMH's featured B&T Duo papers, along with three 12x12" sheets of each of four complementing colors. In addition, I'll pick one of those solid colors and send along an Exclusive Ink Pad in that color ($5.25 MSRP itself), and I include the Duos' Workshop On The Go Instruction Sheet. 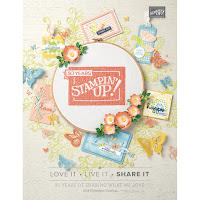 AND I typically send in a surprise, too -- a stamp set? Sample papers? Bling? Shhhh...this month, I'm enclosing the "A Touch of Fall" Petite Perks stamp set, for free! Like surprises along with the best cardstock around?? The CCC is for you! Featured in October is the beautiful Huntington B&T Duo, shown here. If you're interested in jumping on this bandwagon, leave me a comment on this post, or contact me via cardmonkey@comcast.net. 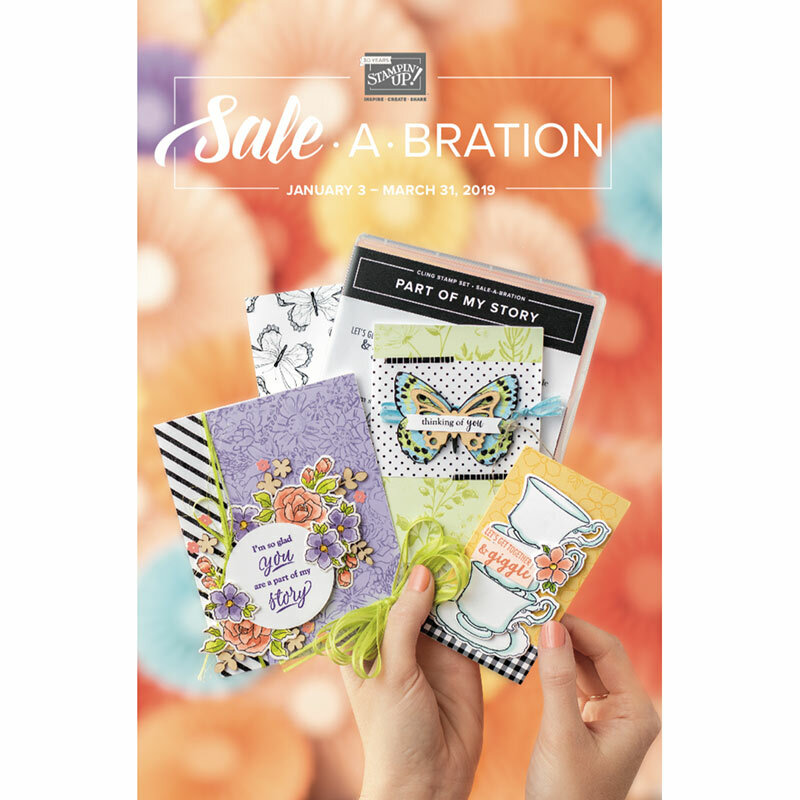 There are many imitators, but no one else hosts the original and best CardMonkey CardStock Club, an innovative way to build your supply (and mine!) with the best cardstock, now available in more than 40 colors! Things go better with Ellen! - Wonderful ideas for sharing a lovely card full of texture and sentiment! My mom, whose favorite chore is ironing, would love what you do with these ribbons!! Hehehehe...Yes indeed you did an awesome job on this!!! Love how smooth the ribbon looks!! Fabulous job!!! 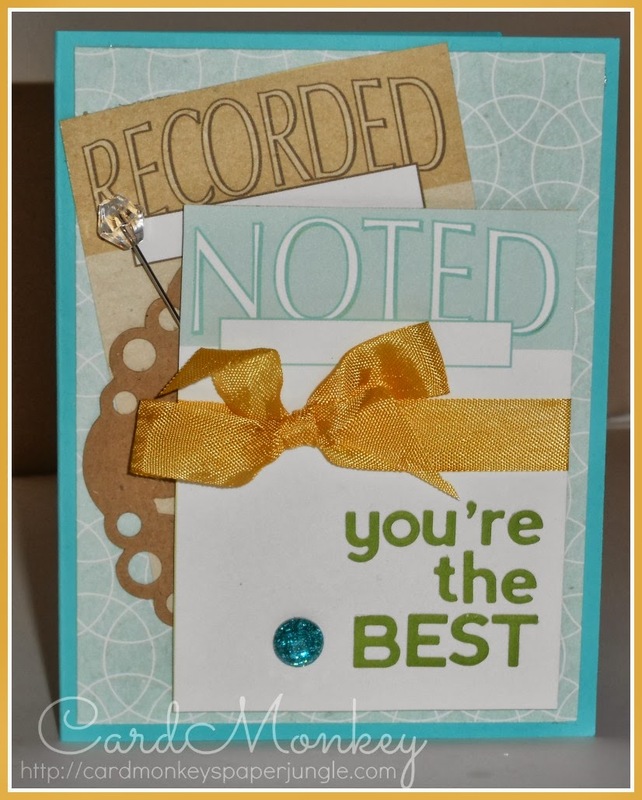 Great color pallet - and I love a card with a stick pin! That ribbon really pops here. Fabulous card!! I love that ribbon smooth! !